External measures include the (1) reduction of emissions, (2) neutralization measures in the catchment, and (3) the treatment of inflows. to atmospheric oxygen. 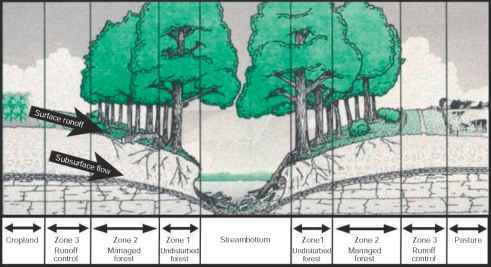 Groundwater for filling the mining lake should be gained from regions where the soil is not, or is only minimally, oxidized. In regions without mining activity, the desiccation of wetlands and changing groundwater levels should be prevented. 'Neutralization in the catchment', achieved, for exam ple, by liming with calcium carbonate, magnesium, or alkali carbonate (e.g., sodium carbonate), is one way to counteract the acidification. An alternative way is to stimulate alkalinity producing processes such as micro bial sulfate reduction and microbial denitrification in the soils of the catchment, provided that sufficient supply of organic substance and N fertilizers can be guaranteed. This can be realized by adding these substances to the recultivated mining waste heaps (e.g., as liquid manure) or by establishing reactive systems with increased decom position of organic matter (e.g., fish ponds with feeding, constructed wetlands). For mining lakes, a number of measures aim at minimizing the groundwater influx. These include the installation of underground bulkheads, the draining of acidic water from the mining waste heaps, or afforestation, whereby water bound transport of acid is lowered by evaporation. Another possibility is to fill the mining lake with well buffered river water to avoid the influx of groundwater. In mining lake areas, the input of acids can also be decreased by the addition of basic materials to the heaps. This measure also introduces P which induces positive feedbacks for alkalinization by increased primary production (see the section titled 'Biological neutralization'). The acid waters can also be neutralized by 'treatment of inflows' in anaerobic systems such as ditches filled with straw bales, constructed wetlands, and anoxic limestone drains. In lake measures against acidification include (1) chemi cal and (2) biological neutralization. Chemical neutralization can be achieved by liming or the addition of other bases. The aims are (1) to detoxify the water to allow the survival or reestablishment of natural flora and fauna and (2) to raise the pH above 6 for several water uses (drinking water, fishery, recreation). Scientific background. Basic chemicals react with H+ ions to form H2O. Raising pH values reduces toxic Al species and dissolved heavy metals. The success and duration of the effects depend on the subsequent delivery of acids. hydrated lime (Ca(OH)2). Calcium carbonate (CaCO3) as dry, finely grained powder is most widely used and is dispersed from boats, pontoon vessels, or helicopters, or distributed on the ice cover in winter. The extent of the impact depends on the retention time and mean depth of the lake and the acidity of the inlet stream water. The liming of large lakes with continuous input of acids and of strongly acidified mining lakes is very expensive. Biological neutralization aims at an increase of biological processes, such as denitrification, sulfate reduction, and primary production, which can lead to neutralization. Scientific background. When all molecular oxygen in the water has been consumed, oxygen bound in NO3, SO42 , or other electron acceptors is used for respiration pro cesses. During these processes the acid anions are eliminated and basic cations (e.g., NH4, Fe2+) are formed. Alkalinity production by these processes demands large amounts of biodegradable organic matter as electron donator. Techniques. An increase in reductive processes can be achieved by saprobization. Ethanol, methanol, and glu cose, as well as straw, potato peels, and cow dung have been tested as organic sources. Alternatively, the required organic material may also be formed by a stimulation of primary production within the lake by the addition of P. The increase in alkalinity is compen sated when reduced compounds such as H2S or Fe2+ are oxidized. Therefore, only a permanent deposition of iron sulfide under strong reductive conditions can lead to long term deacidification. The stratification of the water body should be stable to ensure oxygen free con ditions in the hypolimnion for at least some months each year or, in case of meromictic lakes, in the monimolim nion. Planting trees on the shore, deploying floating barriers on the water, and installing of bulkheads in the lake are measures against wind and wave action that can help prevent full circulation. The combination of che mical and biological neutralization could prove to be an efficient solution. After establishing neutral pH values by liming, the primary production is no longer limited by bicarbonate and the microbial neutralization works more efficiently. Biological measures as new ecotechnologies are still in the development stage, so that only a few examples of whole lake application exist.